Belarusian authorities sided openly with Kyiv in its conflict with Moscow by be willing to help Ukraine in bypassing a possible economic blockade by Russia. 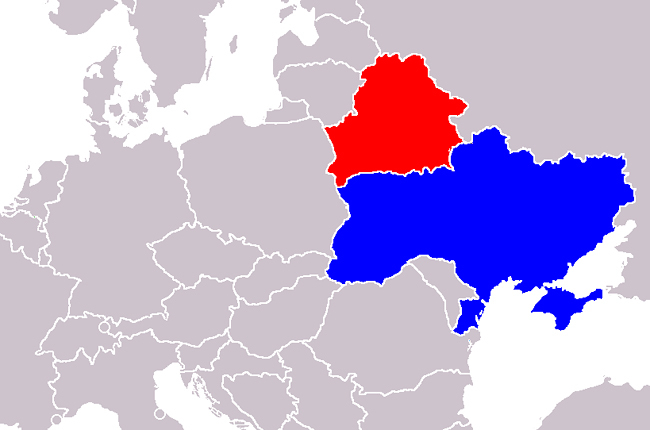 The establishment of joint Belarusian – Ukrainian manufacturing companies in Belarus will neutralise to a large extent the threat of any blocked access to Ukrainian engineering products, including military and dual-use products, to the Customs Union's market. Russia's economic problems are being projected on the Collective Security Treaty Organisation (CSTO), while Belarus cannot even count on Russia's support in re-equipping its national army in the coming years. One can still expect supplies of small quantities of new weapons and transfers of used weapons from Russia's stockpiles. Naturally, there is no question of them supplying any new combat-ready aircraft, something that has been repeatedly announced by Aliaksandr Lukashenka. Moreover, Moscow's behaviour assumes that Russia, taking advantage of Minsk's financial difficulties, could try and bring the Belarusian military under its own control. This reinforces the regime's opinion all the more that Russia is not a reliable partner. The month of October saw the founding of an alliance between Belarus and Ukraine in the military-technological sector. In many aspects, the rapprochement between Minsk and Kyiv has been determined by Moscow's behaviour which has taken its time to meet the expectations of the Belarusian authorities in terms of supplies of weapons and tries to exert pressure on Ukraine in the military industrial sector as well. On 7 October 2013, Ukraine's Deputy Minister of Defence Arturo Babenko conducted negotiations with the Chairman of the State Military and Industrial Committee of Belarus, Siarhei Huruliou, on the development of bilateral cooperation in designing weapons and military equipment. In October, the plans of the JSC Orsha Aircraft Repair Plant, which forms part of the Ukrainian corporation Motor-Sich, to launch batch manufacturing of MSB-2 helicopters (a heavy upgrade of Mi-2 helicopter) in 2015 became public. The plant already has a relevant working programme, the key element of which is the replacement of engines in the Mi-2 helicopters with the AI-450M Motor-Sich engines and some other design solutions including those which involve the body of the helicopter. The promising directions for military and technical cooperation between Belarus and Ukraine include the creation of new anti-tank weapons' models, short range air defence systems, radar detection and helicopter engineering. Belarus is also interested in an Ukrainian programme for the development of a tactical missile complex which, if successfully completed, can become an alternative to the Russian Iskander-E. In addition, Ukrainian industrial potential would allow for the implementation of a missile programme practically without using any foreign-made components. Belarus can contribute to the missile project with its guidance systems and chassis. If the programme receives inter-state status, it will allow for the bypassing of restrictions from the missile technology control regime and provide for the acquisition of missiles by Belarus that have a range of 500 km instead of 300 km. Issues of outfitting the detachments of the Collective Rapid Reaction Force of the Collective Security Treaty Organisation (hereinafter the CRRF) were discussed on 22 October 2013 in Moscow. No specific decisions were made. The reason for this is the financial limitations of the participating countries and the inability of Russia to provide them with material support to the extent necessary. Generally, the alliance's management reaffirmed its commitment to re-equip the CRRF; however, taking into account the immensity of this task, the term for the finalisation of this program remains uncertain. Moreover, the Russian budget does not provide for significant support for international military and technical assistance (there are plans to spend about USD 180,000,000 annually during the next three years for these purposes). And no provision is made for expenses for peacekeeping activities or the maintenance of collective security. The collective defence in the Commonwealth of Independent States (CIS) exists mostly on paper. The plans for the re-equipment of the CRRF were drawn up already in 2009. However, Belarus has not seen any real financial support for them, aside from insignificant quantities of small arms and communication equipment. Even the military uniform manufactured for the CSTO peacekeepers, funded by Russia's budget, is kept in warehouses and distributed to servicemen for joint military exercises only. In October, Angola and Russia signed a contract for weapons and military equipment. The package includes 18 fighters Su-30K which were earlier used by the Indian Air Force and kept on the airfield of JSC 558th Aircraft Repair Plant in Baranavichy. The Belarusian Air Force had long expected to receive these planes. However, Russia asked them to pay for them, and Minsk was willing to acquire them only on a gratis basis, citing financial difficulties and the allied spirit of the Union State of Belarus and Russia. The sale of former Indian fighters Su-30K to Angola means that prospects of getting new or relatively new combat planes with Russia's support are postponed for an indefinite term. Taking into account the constant appreciation of Russian aircraft, the attractiveness of Chinese fighters will steadily increase in the future. Especially when taking into account that the People's Republic of China has mastered the manufacturing process of creating what are essentially improved clones of the fighters Su-27 (J-11B), aircraft that is well known by the Belarusian Air Force. On 29 October 2013, a joint meeting of the boards of the defence ministries of Belarus and Russia took place, after which Russia's Minister of Defence Sergey Shoigu made a number of statements. Thus, he said that the parties are finalising a draft agreement on the deployment of a Russian air force base in Belarus. In the nearest future, it was noted, Moscow would transfer four antiaircraft missile systems S-300 to Belarus. Also, Russia would continue to support the maintenance and development of Belarus' military infrastructure. A Russian representative once more raised the issue of establishment of the Russian air base. The Belarusian authorities are painstakingly careful to avoid this issue. Drafting of the agreement on establishment of the Russian air force base may take quite a while. Then, there will be the issue of getting it approved and agreeing on the start date of its implementation. This is evidenced by the situation with the establishment of a unified regional air defence system of the two countries (three years have passed between the signing of the agreement and its ratification by the Belarusian side). In any case, Minsk is getting ready for some fierce bargaining and to take advantage of the continued aggravation of differences between Ukraine and Russia, derived from Ukraine's future association with the European Union. Speaking about the prospects of supplying the anti-aircraft missile S-300 system, the question of the modification of the weaponry remains open. Earlier, it was announced that it would be done in accordance with the PMU-1 modification. Russia's assistance in maintaining the military infrastructure will likely be limited only to those sites which are of interest to the Russian military: airfields, arsenals and warehouses and, possibly, air defence, communication and command sites. Russia is more interested in exploiting the Belarusian military's potential than in building up Minsk's military capacity.